Sixty-three-year-old Mark Hazel has had four heart attacks in 17 years, the latest one due to a 100 percent blockage of a coronary artery. To help prevent future heart attacks, Hazel had 13 stent placements; 12 of which were done at BSA Health System. Stent placements are small tubes inserted into the coronary artery to help keep the artery open, promoting blood flow to the heart. Hazel had his last heart attack in November 2018. The day of the heart attack, Hazel was remodeling a kitchen, requiring him to lift heavy cabinets. He said the day had been stressful with more work requests coming in. As he was preparing to go to another client’s house, he experienced chest pain. At the client’s house, Hazel’s pain worsened and he realized something wasn’t right. Exhausted and still in pain, Hazel drove back to his home. His health took a turn for the worse while unloading his trailer in his backyard. “The next thing I knew I was laying on the ground,” he says. Hazel called his wife, Joann, and explained that he didn’t know what had happened or why he was on the ground. Joann called an ambulance immediately. While waiting for the ambulance, Hazel was able to climb back into his van and drive to the front of his house. When the ambulance arrived, Hazel was slumped over his console and unable to move. 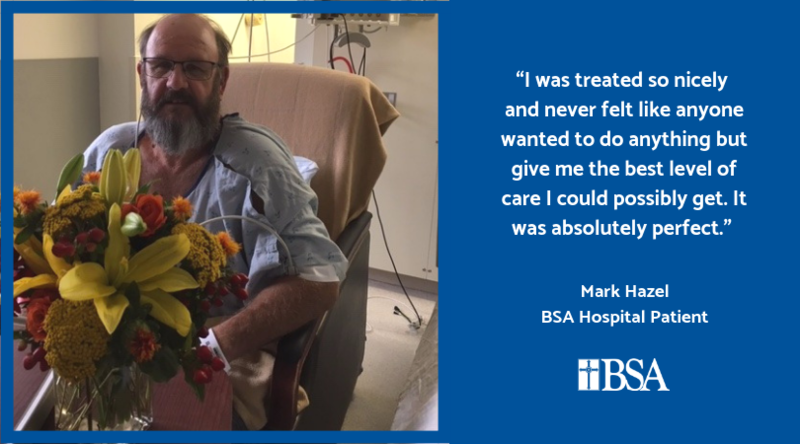 Hazel was rushed to the BSA emergency room and within 45 minutes, he had a stent placed in his coronary artery. Hazel is appreciative of the readiness of his nurses and staff who were constantly there to monitor and check on him. After his heart attack, Hazel returned to work with light duty restrictions and was placed on a heart-healthy diet. According to the American Heart Association, 210,000 recurrent heart attacks take place each year. When a heart attack strikes, every minute matters. If you are experiencing a medical emergency, call 9-1-1 for immediate medical attention. To learn about BSA’s heart and vascular center click here.